ESA's exoplanet-characterising CHEOPS satellite being prepared for electromagnetic compatibility testing inside the Maxwell chamber at ESTEC, the Agency's technical heart in Noordwijk, the Netherlands. Once the chamber's main door is sealed, Maxwell's 12 m-high metal walls form a 'Faraday Cage', blocking electromagnetic signals from outside. The 'anechoic' foam pyramids covering its interior absorb internal signals – as well as sound – to prevent any reflection, mimicking the infinite void of space. Once switched on CHEOPS was illuminated with a two-way radio beam. The satellite was then rotated and tilted through various angles to detect any potentially harmful electromagnetic 'cross-talk' that might occur between its subsystems. Testing also ruled out any radio emissions arising from the satellite that might interfere with its launcher during its rise to orbit. ESA's CHEOPS satellite will measure the sizes of known exoplanets by detecting tiny fluctuations in the light of their parent stars. CHEOPS, or 'CHaracterising ExOPlanet Satellite', combines a state-of-the-art scientific performance with a compact design – 1.5 m by 1.4 m by 1.5 m in size, it weighs in at about 300 kg fully fuelled – allowing it to be flown as a secondary passenger on a Soyuz launcher inside its ASAP-S adapter. 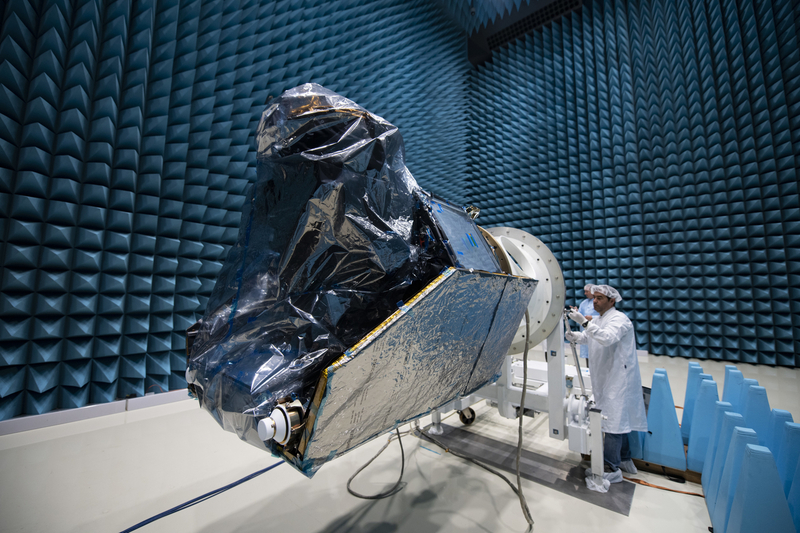 Last month, once its ESTEC test campaign was complete, CHEOPS left ESTEC for Airbus Defence & Space's facility in Madrid to undergo further evaluation, including testing of its solar arrays, a 'leak check' of its propulsion module and a fit-check with its launcher adapter. Once all tests are done, the satellite is planned for launch next year from Europe's Spaceport in French Guiana.